Place : Room #313, Business Admin. Bldg. UNIST will be holding a Writing Workshop Series in the first half of 2016. The 2nd lecture will be held on the 16th of June 2016, inviting Adjunct Professor Pieter Stek of MyongJi University. 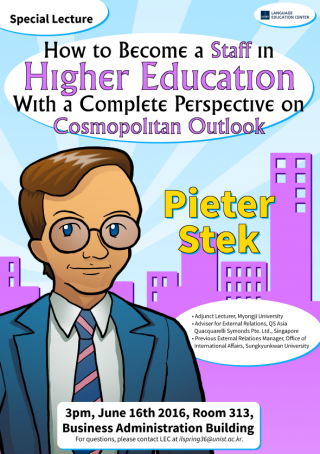 Prof. Stek will be presenting on “How to Become a Staff in Higher Education: With a Complete Perspective on Cosmopolitan Outlook”.